Capturing video for documentation, editing or archiving in today’s online connected world is a must for many companies trying to keep there content available. Having a good video capture device to facilitate this is essential. Whether you are a professional or amateur videographer, using a proven and reliable method is crucial to your success. There are many things to consider when recording video like the type of encoding, quality and file size. Many boxes clam to be field ready, let’s look at some that will do the job and will make you look good. The Blackmagic Design H.264 Pro Recorder is a nice little capture device that will allow you to encode SD and HD quality video. This box will allow you to record on to a Mac or Windows based computer through a 2.0 USB cable. Your video capture inputs are HDMI, SDI or analog component. It also allows audio capture through stereo balance 1/4″ inputs. 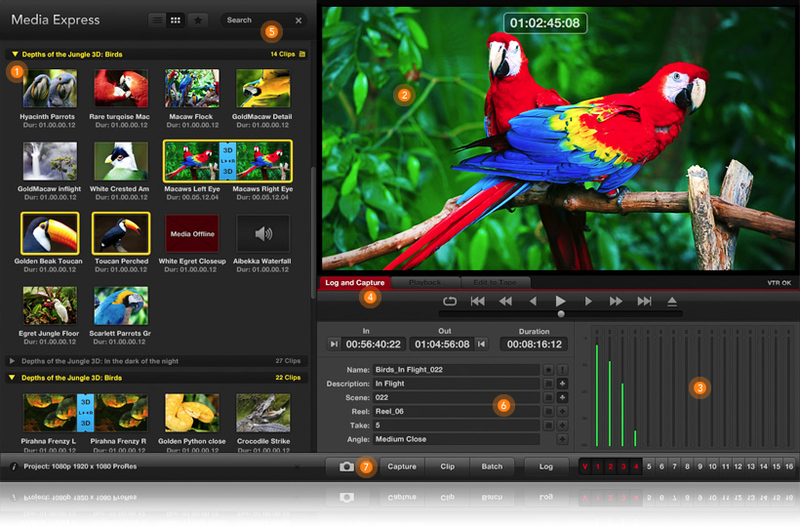 You can capture all of your video files through Blackmagic’s Media express capture software. It is easy to use and offers a real time encoding timer and two VU meters for monitoring audio levels. The software also allows you to make changes to your video and encoding quality, file destination and file format. This device will withstand long recording sessions without crashing. Using the H.264 encoding format will keep your file size relativity small, without sacrificing your quality. This device is great for live event recording and archiving. I have used this device on multiple events and have been very satisfied. This device is must if you plan on playing back on an iPad, iPhone, Apple TV or YouTube. One recommendation if using this device for prolonged hours is to unplug it and allow it to cool. Sony compatible RS-422 deck control port. 625i/50 PAL and 525i/59.94, 480p NTSC. Capture at full HD or SD resolution, or use direct resize in realtime to scale and encode for the intended playback devices, such as iPhone, iPad or iPod. Media Express, Blackmagic System Preferences and Blackmagic driver on Mac OS X. Media Express, Blackmagic Control Panel and Blackmagic driver on Windows. The Epiphan Lecture Recorder x2 is a simple yet effective way to record a live event or for video capture. This box is also equipped to do live web streaming. You can choose several different options of recording styles from screen capture and picture and picture. This device will capture HD video and computer slides and record it using an internal storage device. You do not need any software to run this device. Just hook it up using a computer and an Ethernet cable. Then launch a web browser to configure and record your videos. File transfers can be done via Ethernet or a portable USB device. By using this capture device, your file sizes will stay manageable without losing quality. Each device internally contains a removable USB Kingston drive that can be upgraded for larger recording capacity. This is a good rock solid device which I have used out in the field many times. Download recorded videos (AVI, MPEG-TS or MOV) using the Web UI and playback through any compatible player. Having a good recording and capture solution for live events or archiving can make or break your career. You can rest assured that using one of these video capture devices on your next job will be successful.